Translating life, history, and conversation into stories that inspire. 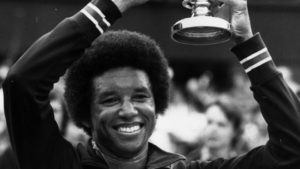 In 1989, I cast Arthur Ashe as host of The Other Side of Victory – a syndicated sports TV series that focused on the lives of black athletes and the issues that affected them. In spite of being executive producer, I knew nothing about tennis. Still, I felt blessed to know the man who earned world status as the first African-American to win the men’s singles at Wimbledon and the U.S. Open. The one strange thing about this seemingly perfect, humble man, was that every time he flew to Los Angeles, Arthur desperately tried to escape. He obsessed about “getting the next flight out smoking,“ even if it meant having a middle seat on a red-eye in economy class with layovers —which of course, he never had to do because some sympathetic flight attendant would give him the automatic upgrade. “Can’t you take one of the canyons?” he’d insist when I’d get us stuck in California traffic. The former USC student knew all the shortcuts to the airport better than me—a Cleveland transplant. “What’s your hurry?” I’d ask. “We’ve got all the time in the world.” I was wrong. Arthur had little time. He had AIDS. His hardest match. I had no idea what Arthur had been hiding until the day he decided to share his gut-wrenching secret with me—long before he shared it with the world. In 1989, little was known about the disease—only that there was no cure. I promised Arthur that I’d tell no one except my immediate boss who we agreed had a right to know. It wasn’t until April 1992 that Arthur announced to the world that he had contracted AIDS from a blood transfusion. Sadly, the timing of his public announcement was forced once he learned that a newspaper was preparing an article about it. He hated the intrusion into his privacy. He thanked my boss and me for respecting it for nearly three years. On February 6 (my mother’s birthday) 1993, Arthur Ashe died. I miss his smile and will always applaud his talent and courage. To this day, one of my most cherished possessions is a tennis ball Arthur signed for me. I treasure it as much as my relationship with him, and the confidence he had in me to share something so private that ultimately took his life. *Look for more of my association with Arthur Ashe and lessons learned from other notables that I’m compiling for my book, AND THEN WHAT HAPPENED? For updates, subscribe to my RSS feed or visit www.shirleyneal.com.